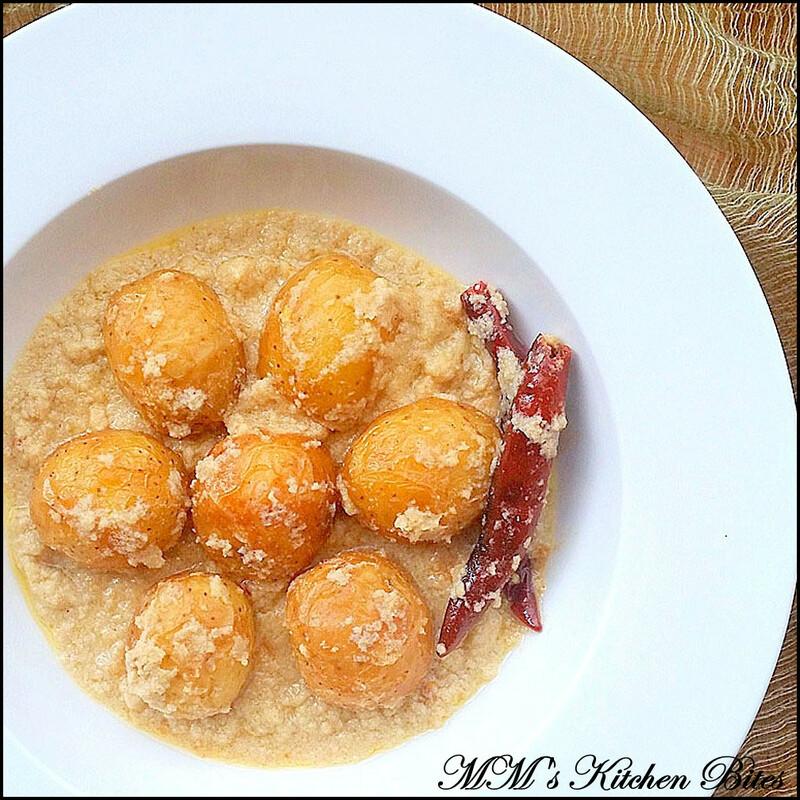 MM's Kitchen Bites: Shada Aloor Dom...the yin and the yang!! Soak posto and coconut in about ¼ cup of warm water for half an hour. Blend into a smooth paste. Keep aside. If using the air fryer – add 1 tsp oil to coat the potatoes. Preheat the fryer at 200C for 10 minutes and then bake for 10-12 minutes till the outer layer crisps ups. Toss once or twice in between. For stove top method – Heat 1 tbsp oil in a heavy bottom pan (with lid). Once the oil is hot, add in the potatoes and toss around till the outer layer goes crispy and bits of gold appear. Remove the potatoes from the pan using a slotted spoon and keep aside. Heat 1-2 tbsp oil in the same pan. Add in the whole dried red chilies and fry for about 5 seconds. Remove the chilies and keep aside (to be added back later – added initially to flavor the oil and removed so that they don’t split and bleed colour into the gravy). Add bay leaf followed by green cardamoms, cloves and cinnamon. Once the spices start to sizzle, add in the coconut and poppy seed paste made earlier. Fry the paste on low heat, till the oil separates – the paste would have changed colour to a very pale golden and come together. Add in the green chilli paste and ginger paste, mix well and fry for another minute. Add in the water, mix well and simmer till the gravy reduces by about half and oil starts floating on top. Cover the pan and simmer till the potatoes are done and the consistency of the gravy is to your liking – about 10 minutes. Remove cover and switch off the heat. Add in the ghee, remaining ¼ tsp roasted cumin powder and the fried red chilies kept aside earlier. Stir, cover and let rest for 5-10 minutes.